King Robert’s youngest brother, the 21-year-old Lord Renly rules Storm’s End, which Robert gave to him when he ascended the Iron Throne. Some say he’s the handsomest man in the Seven Kingdoms, and others say he looks almost like Robert’s twin when Robert warred against the Targaryens. Tall, broad-shouldered, with fine black hair and startling blue-green eyes, Renly is all a lord should be. 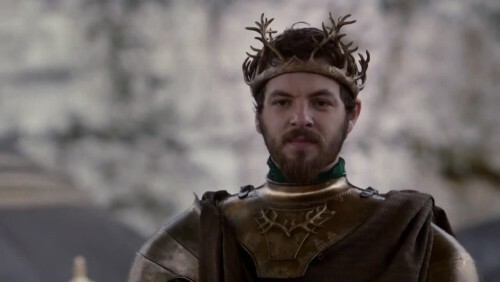 Serving as the master of laws on the small council, Renly is a skilled courtier, charming to the extreme, and with a close connection to the Reach through his friendship with his former squire, Ser Loras Tyrell, the famed Knight of Flowers. He’s also the most fashionable man at court, its said, stinting nothing for his comfort. His love of pageantry is well known, and he cuts a dashing figure at tournaments in his forest green armor with gilded antlers rising from his helm. The actor cast is about six years older than the character, and not quite 6’ tall, although this may be in keeping with the fact that Mark Addy (cast as King Robert) is even further from being Robert’s book height of 6’6”.